As you all, who are regular here, already know that few weeks back I posted about the promising debut in skin care range “L’oreal Paris Skin Perfect Anti- Imperfections+Whitening Cream 20+” and “L’oreal Paris Skin Perfect Anti-Imperfections+Whitening Cream 30+” and also discussed about what I liked about this particular range. 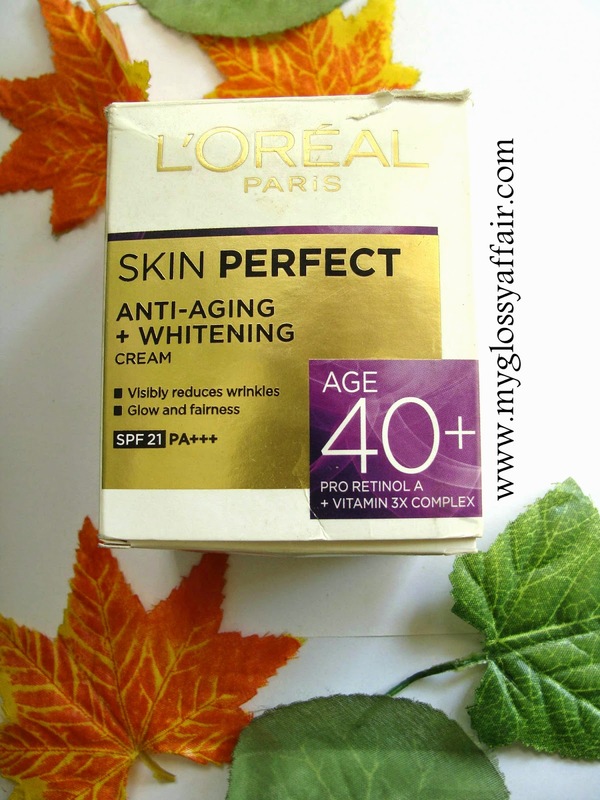 For all those who are new here, let me give you a brief, L’oreal has come up with all new Skin Perfect Range for 20+, 30+ and 40+ age group and has launched skin perfect anti-imperfections + whitening cream, keeping in mind all age specific requirements. 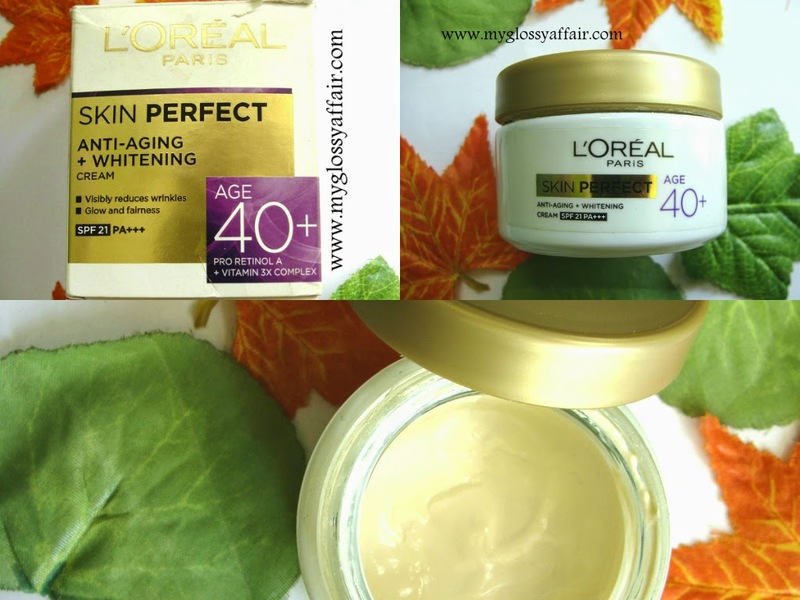 Today I am here with my take on “L’oreal Paris Skin Perfect Anti- Imperfections + Whitening Cream 40+”. From the age of 40, aging and daily aggressions such as exposure to UV rays, may cause wrinkles and dark spots to appear, skin loses its firmness. L’oreal research has selected powerful actives and specifically designed this cream to act on skin texture and skin tone of Indian women from 40 years old. So, I got 3 creams from L’oreal for 3 age brackets. One 30+, I used. 20+ cream was used by Ritcha and she also found it to be quite good. This 40+, I got my mum to use so that we can see the effects as claimed by the brand properly. So, as told in her words, “I feel that my skin is more fresh and toned whenever I use it. Over the time, my skin has improved a bit after continuously using it for over a period of time. And the good part is that I don’t feel the need to apply any BB cream or separate sunscreen after using this cream. The sunscreen present in this cream suffices for me”. As my mum is working and leaves very early in morning, she doesn’t have much time for her face on daily basis. What works best for her is that she doesn’t need to use any other product or anything with this cream. Only one cream on face, a little lipstick and she is ready to go. She doesn’t apply any other thing. Talk about whitening, I don’t believe in whitening of skin, but yes, it makes her skin look more fresh and clean and over the time, it has become more even and toned. Skin quality, but her skin has always been great!! ;). Oh…forgot to mention, she has normal skin, neither oily nor dry and this cream suits her perfectly. My mom too loved it but yes whitish cast is a prob in this cream. Thanks for review! Id love to try this!! Great review! Sounds like your mom achieved a good result. Thanks for sharing! Seem like a nice product but wish Loreal can come with a cream for those like me above 50. Very well! Excellent work 😉 Your review is to admire to. Its very helpful and full of little observations!